The exhibition reimagined/reinterpreted a former exhibition by American artists Renée Green and Sam Durant: Making History, 1999 curated by Jennifer Dunlop in the same galleryspace at CCS Bard, Annandale on Hudson, NY. As an example of the breakdown of social systems, both artists refered to Kent State Ohio in 1970, where National Guardsmen shot at students protesting the US invasion of Cambodia during the Vietnam War. The following artworks are part of the overall installation. 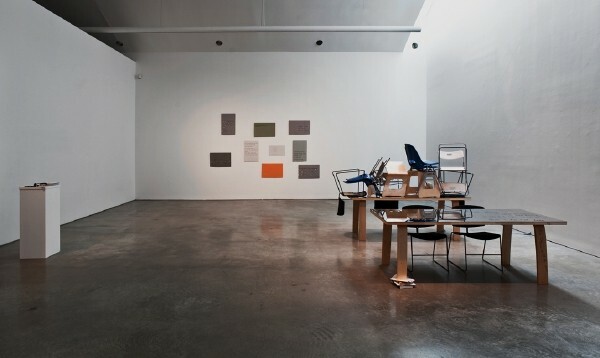 While the used materials such as paper, furniture and sound refer exactly to the artworks by Sam Durant in his 1999 exhibition the contents and the techniques differ.